and the second after her years in the desert as an ascetic. 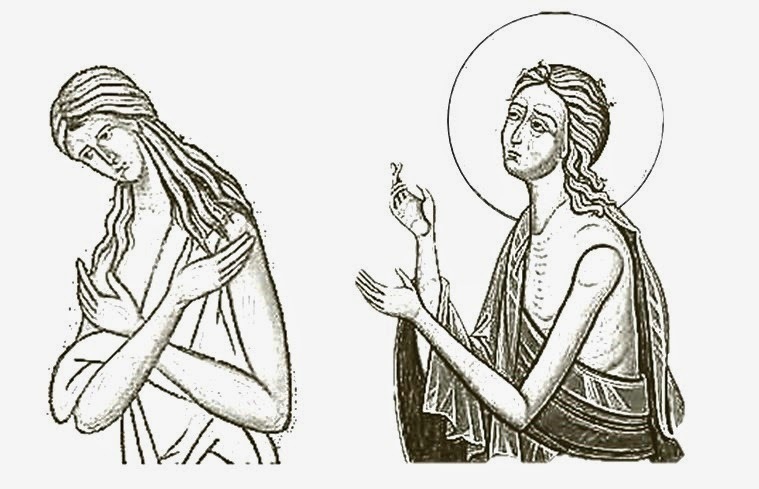 I chose these two images because one depicts the humility needed to bring about repentance, and the second with hope and stronger faith, prepared to meet God at her death. 4. 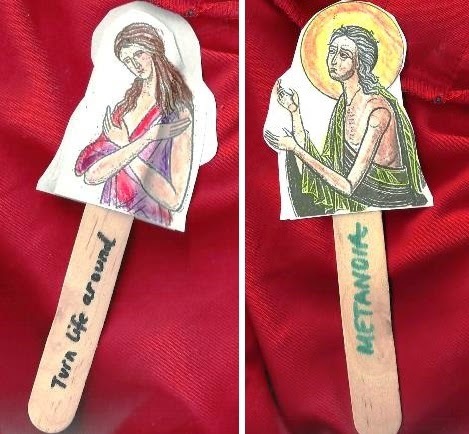 Write the word "METANOIA" (or REPENTANCE) on the sticks with the definition "Turn one's life around" on the reverse side. As I retell the story, I'll ask the children to show me which side of her we're looking at. Then, we will literally, TURN HER LIFE AROUND, but rotating our sticks to see her as a transformed woman of God, one of the most memorable Saints of our Church. She left home at 12 years old, to a live a life of sinfulness in the city, one which would not bring her happiness, but emptiness and distance from God. 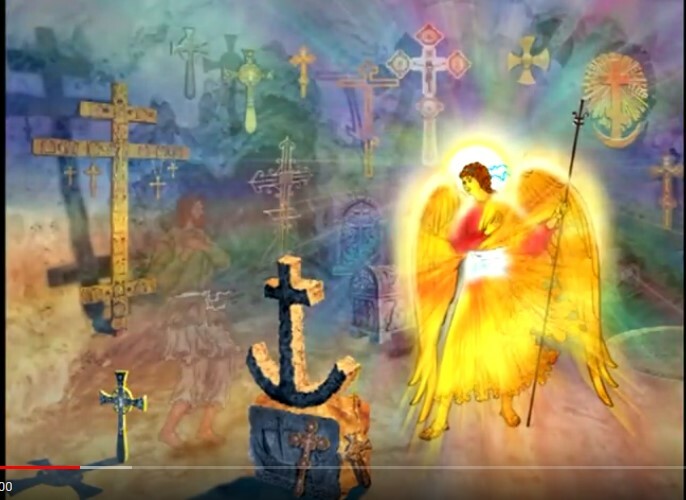 When God prevented her entrance into the Church to venerate the Cross of Christ, it was a BIG WAKE UP CALL, to stop and look at herself as unworthy, and in need of healing. She did not flee to the desert to punish herself, but TO FIND HERSELF, that is, the true self that God created her to be, beautiful in His eyes. She departed for the desert without much, but had one important thing: faith in God that He would provide for her daily food and shelter for 47 years. 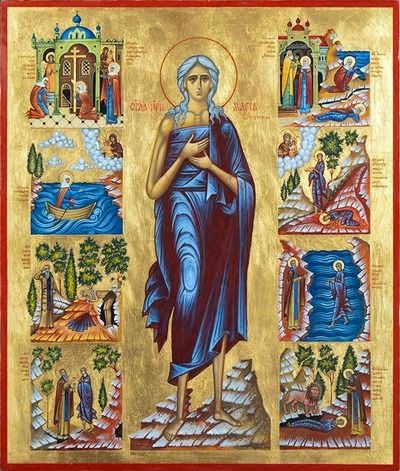 Lastly, the four miracles show us that she became transformed and pleasing to God: she had the gift of clairvoyance and knew Father Zossimas' name before he told her, she was seen elevated off the ground in prayer, she walked on water to cross the river to receive the Holy Eucharist, and lastly, the lion was sent by God to help bury her. I am unworthy to ask forgiveness for myself, O Lord, for many times have I promised to repent and proved myself a liar by not fulfilling my promise. Thou hast picked me up many times already, but every time I freely chose to fall again...If a righteous man can barely be saved, then where will I end up, I who am lawless and sinful? If the path that leads to life is strait and narrow, then how can I be vouchsafed such good things, I who live a life of luxury, indulging in my own pleasures and dissipation? But Thou, O Lord, my Saviour, Son of the true God, as Thou knowest and desirest it, by Thy grace alone, freely turn me away from the sin that abides in me and save me from ruin. Quote from 120th 'Psalm' in St Ephraim's Spiritual Psalter by our Holy Father St Ephraim of Edessa, the Syrian; excerpted and arranged by Bishop Theophan the Recluse according to the manner of the psalter of the Old Testament. Thank you for this! I'll be doing this this afternoon with my preschoolers. Great, Thanks for share, This is very inspirational. How can anyone create this.